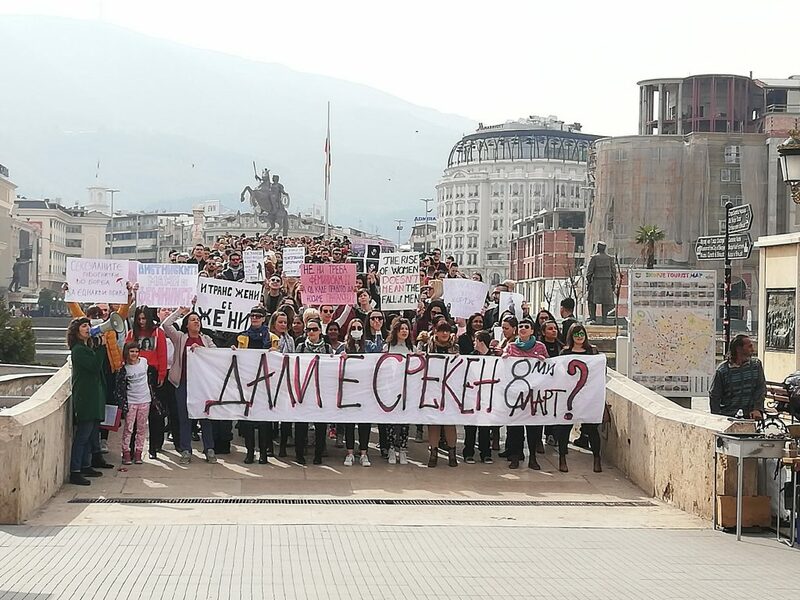 Attended by hundreds of women, the March for Women`s Rights started from the Park “Zhena Borec”, where the activists publicly called for changes which would result in genuine betterment of the status of women in our society. “The continuing social, economic and political inequality of the women in Macedonia is the reason why we are gathered here today to express out revolt, concern and disappointment. Women continue to be inactive in the labor market despite the fact they are more educated than the men. Violence against women and girls is a sad reality in our society. Stereotypes, hatred and misogyny are present not only in the private sphere, but in the public discourse as well” said Sneska Ilikj from Reactor – Research in Action. Salija Bekiri Halim from the Women`s Initiative from Shuto Orizari addressed the multiple discrimination against Roma women for being women, for their socio-economic stats and their ethnicity. She called on the state to undertake concrete measures to put an end to child marriages and the illegal charging of primary care gynecologists and to pass the Law on Protection against Discrimination. Vangelina Parmachka from the National Federation of Farmers stated that women were invisible pillars in the rural areas, but they are facing challenges and problems. Parmachka underlined the necessity to remove the discriminatory measure from the Rural Development Program for 218-2021 which set as requirement that women should be married, have at least one child, be unemployed, housewives and live in an area populated by at least 200 people at 700 meters above sea level in order to qualify under the program. “It is high time that the institutions in this started working for its women citizens as well!” – was the conclusion of the Manifesto for Women`s Right read by Jovana Jovanovska Kanurkova from the Helsinki Committee for Human Rights. The march then proceeded to the Square “Macedonia”, and ended at the square “Phillip II”. The March for Women`s rights is organized by women activists and the Platform for Gender Equality.